This course is designed for those who want to trim and shoe their own sound horses. Individuals will receive training in fundamental horseshoeing skills using factory made shoes. Farrier training is a process—and one that takes time and dedication. In 12 weeks, students will be well-grounded in the basics of trimming and flat-shoeing their own horses. This course will be a prerequisite for those who want to shoe horses for the general public. It is not, however, intended to train an individual to enter the field as a full-time, professional farrier. 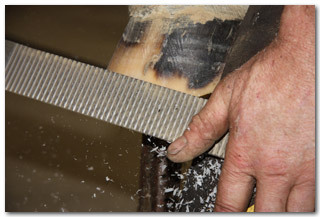 The student will learn to assess and maintain basic equine hoof health through study of fundamental farrier principals. A basic level comprehension of limb anatomy, foot dynamics, conformation, gaits and foot lameness will be attained. The student will know how to use and maintain farrier tools, how to trim sound horses in balance, and how to shape and nail ready-made shoes with the use of a forge. In addition, the student will attain working level skills in forging common modifications on factory shoes. Basic forging instruction may also be included if the student has completed the necessary prerequisites. The course covers proper horse handling as well as intermediate anatomy and physiology, equine biomechanics and basic shoe modifications. *This course is avocational and not designed for career training. It is neither accredited by the ACCSC or approved for Federal Financial Aid. Live Horse Trimming 72 hrs. Shoeing Feet & Horses 79 hrs. Individual Practice Time in the Forge 91 hrs.